In late 2017, Indianapolis was identified as a top trending American city for Airbnb. 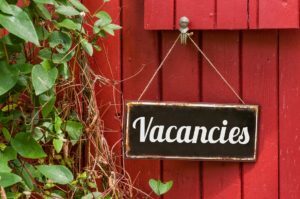 The company also announced that Indiana hosts welcomed approximately 175,000 arrivals in the past year – earning more than $20.7 million. The 175,000 guest arrivals to Indiana via Airbnb represents 108% year-over-year growth. This comes as “Hoosiers increasingly embrace the home sharing platform as an opportunity to earn supplemental income and make ends meet.” There are now just under 3,600 Indiana hosts who share their homes via Airbnb, 37% of whom simply share an extra, unused room (i.e. empty nester). Fort Wayne’s Brotherhood Mutual Celebrates 100 Years! 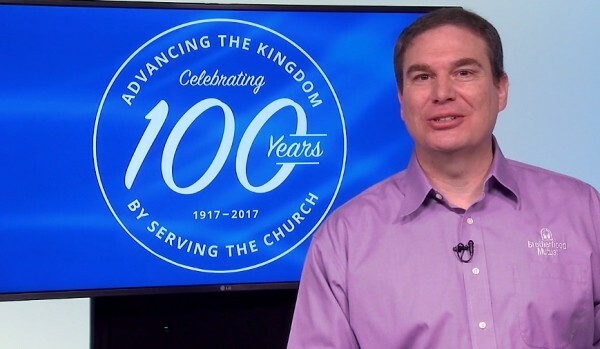 VIDEO: President & CEO Mark Robison talks about Brotherhood Mutual’s bright future as the company celebrates 100 years of mission-driven service (click on image to play). Brotherhood Mutual Insurance’s impressive and sustained success is no shock if you’ve spoken with executives at the company. I learned that in 2015 when I interviewed its president for a BizVoice story on recurring honorees of the Best Places to Work in Indiana list. The company also supports employees’ adoption efforts, among many other family-focused benefits offered. This type of attitude is likely one of the reasons Brotherhood Mutual is celebrating its 100th anniversary in 2017 — a remarkable milestone indeed. Also read this 2010 BizVoice feature on the company. Here’s to 100 more years of success for this Fort Wayne business! “We must stay on course, because the ramifications are too important. 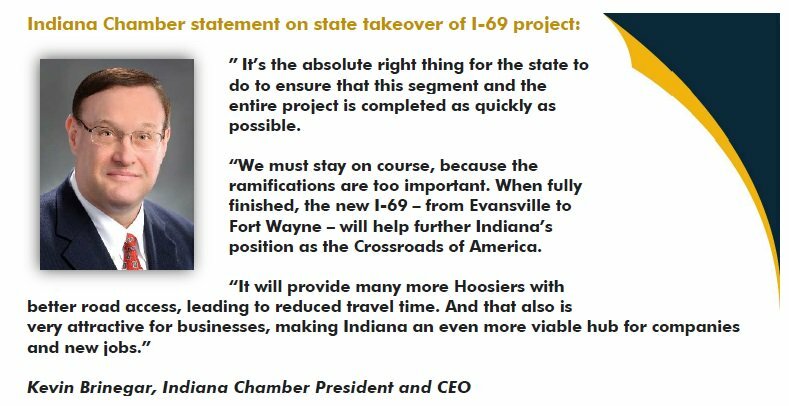 When fully finished, the new I-69 – from Evansville to Fort Wayne – will help further Indiana’s position as the Crossroads of America. 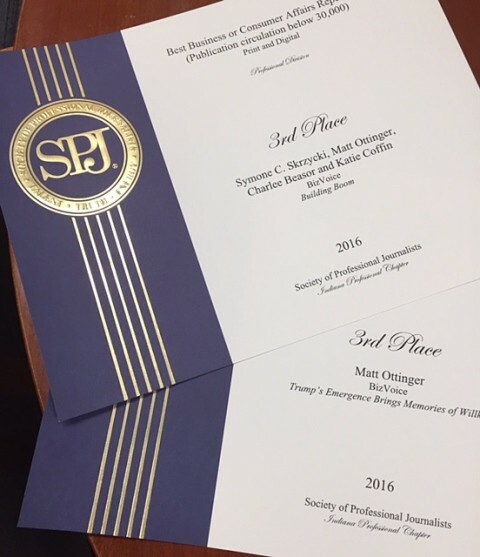 Best Business or Consumer Affairs Reporting – 3rd Place: The “Building Boom” section in the July-August 2016 edition, featuring stories on the Ohio River Bridges Project (Katie Coffin); Ash Skyline Plaza in Fort Wayne (Symone Skrzycki); downtown Evansville medical campus (Charlee Beasor); construction roundtable (Symone Skrzycki); and Indy airport converting land to new uses (Matt Ottinger). The state’s controversial proposed lease of its cell phone towers, fiber and public rights of way to Ohio-based Agile Networks officially won’t happen. Governor Eric Holcomb put an end to it in an announcement Thursday. The Indiana Chamber applauds his decision and had been advocating for such a resolution. Funds from the proposed $50 million lease were earmarked for bicentennial construction projects, with the Agile agreement promoted as a way to bring greater connectivity to rural areas. Beginning last September, after learning in more detail about the agreement, the Chamber voiced significant concerns and objections on behalf of the state’s telecommunications industry. Chamber President and CEO Kevin Brinegar had numerous discussions with the Indiana Finance Authority and State Budget Committee members – the groups needing to approve the deal. The Chamber made a clear request that the agreement not proceed. Therefore, we are very pleased that Gov. 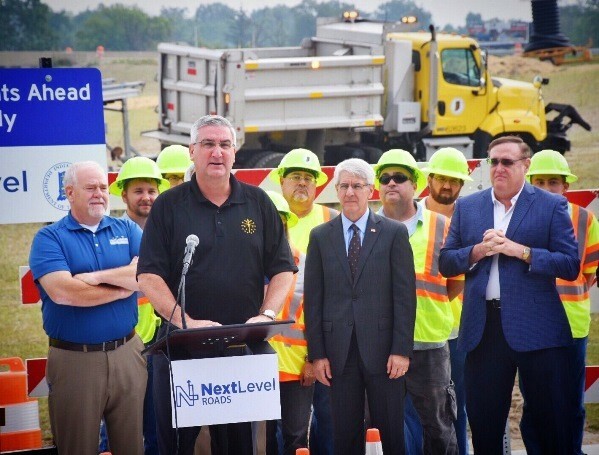 Eric Holcomb shared our belief that this deal was bad for Indiana. The Chamber believes that’s the correct approach. Our board-approved position supports free market competition in the delivery of advanced telecommunications services. Yet this deal went too far and essentially suppressed this important principle. Not to mention, good Hoosier companies inexplicably were not even given equal opportunity to bid for the project. Additionally, all industry players and competing technologies should be on a level playing field. However, this proposed deal would have only served to pit the state against private providers. Getting better broadband access to rural areas of the state should be a priority. That was unlikely to happen with the now-defunct deal, which would have done nothing to drive Agile Networks to serve our rural areas. The company’s publicized plans were to build in the state’s largest cities – Evansville, Fort Wayne and Indianapolis – where cable and broadband services and competitive choices already exist. Looking ahead, the Chamber pledges to work with state government in any way it can to advance the effort to truly bring connectivity to rural parts of the state. These areas must be brought up to date technologically to help reverse their downward population and economic trends. During a six-hour hearing before the House Roads and Transportation Committee, there were some technical changes made in the bill and the annual increase for the fuel tax was capped to no more than one cent per year. Chamber President Kevin Brinegar provided testimony that this bill was about “revenue recovery” on the lost buying power of the gas tax since it was last raised. (Read the Chamber’s full testimony.) That lost revenue, plus better fuel economy means less money for roads. The Chamber is grateful to board members Drew Coolidge with SIRVA (moving company) in Fort Wayne and John Thompson (owner of several Indiana-based businesses) who testified how better roads impact their business, their communities and Indiana. House Bill 1002 will be considered in the coming weeks by the Ways and Means Committee before the desired House floor vote. Call to Action: Connect with your state representative via our grassroots page. Let them know today that long-term funding is important to you and your company! “We support INDOT’s decision that the State Road 37 corridor is the best alternative for completing the I-69 extension and it will be the best investment for Hoosiers. The corridor requires far less new construction than the alternatives, impacts the fewest homeowners and has the most consensus among all interested parties. “We commend INDOT on the thorough selection process and the analysis used to come to this decision. 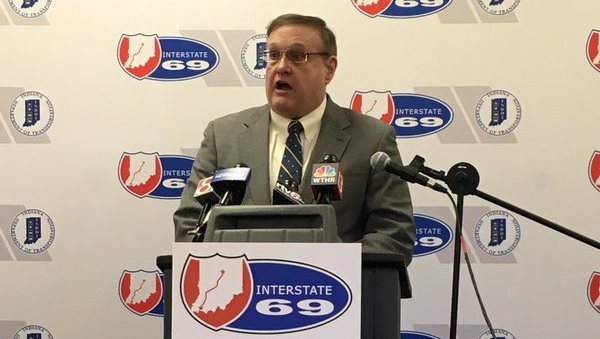 “While we’ve made much progress on the I-69 extension – most recently with the opening of Section 4 in Greene and Monroe counties in December – there is still much to be done from the Bloomington area up to Indianapolis. The state must remain committed to funding this important project and seeing it through to completion. Monica Chamberlain has joined the Indiana Chamber of Commerce as its new membership manager for the north central and northeastern regions of the state. Chamberlain had spent the last seven years increasing revenue and enrollment at Indiana Tech in Fort Wayne, serving as the associate vice president of enrollment management. She was the institution’s director of admissions for three years prior. Chamberlain resides in Fort Wayne and will continue to work out of that location. She will be charged with business development in 29 Hoosier counties: Adams, Allen, Blackford, Cass, DeKalb, Delaware, Elkhart, Fulton, Grant, Howard, Huntington, Jasper, Jay, Kosciusko, LaGrange, LaPorte, Madison, Marshall, Miami, Noble, Pulaski, Randolph, St. Joseph, Starke, Steuben, Tipton, Wabash, Wells and Whitley. Chamberlain holds a master’s degree in English and a bachelor’s in French, both from Indiana University. “Monica has a strong connection to the Fort Wayne area community and beyond. She will be reaching out and visiting businesses to let them know how Indiana Chamber membership can help grow their organizations,” says Jennifer Elkin, Indiana Chamber senior vice president of marketing. Prospective Indiana Chamber members can contact Chamberlain at (317) 264-6875 or mchamberlain@indianachamber.com.